If you're looking for an industrial property to rent in Leicester for manufacturing use, you will need to establish if it is suitable for light or heavy industry. Properties that come under the light industrial classification in Leicester are generally suitable for small assembly lines or similar purposes. In contrast, heavy industry might include food processing or steel work. Whatever plans you have for the industrial property to rent in Leicester, MOVEHUT can help you find the one that's right for you. Every commercial property in Leicester comes with a classification that determines its permitted usage. If you're searching for an industrial property to rent in Leicester, being aware of the property classification will help you. Once you have established the correct classification code for your business, let MOVEHUT help you find the ideal industrial property to let in Leicester. If you're planning to carry out an industrial property in Leicester to rent search, then be sure to take a look at our tips here at MOVEHUT. One important tip is to have your budget already planned and mapped out before you start your industrial unit search, which will definitely keep your property search on track. Why not get started with MOVEHUT today, and find an industrial property in Leicester that is excellent for you. If you have found an industrial property in Leicester that interests you, it is advisable to arrange a viewing prior to renting. It's important to make sure that any industrial unit you view has the required security features for your business, such as working locks and alarms if required. If the industrial unit has air conditioning, then it's important to make sure it's working and has the correct service reports. These tips from MOVEHUT will help you make the right choice when viewing an industrial property to let in Leicester. When searching for an industrial property to rent in Leicester, you will need to consider the best location. 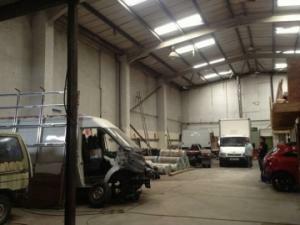 You ideally want a location for your industrial unit that gives you easy access to local amenities in Leicester. Why not get your industrial unit search in Leicester going, and let MOVEHUT help you find a fantastic property in a location that really works. If you do come across an industrial property to let on our website that you like, then I'm sure you will want to submit an offer. When putting an offer in on a rental industrial unit in Leicester, you will usually arrange for your surveyor to submit the offer to the landlord or to their marketing agent. We love nothing more than when our visitors make a successful industrial property offer, so search our database and find your ideal property to rent today.